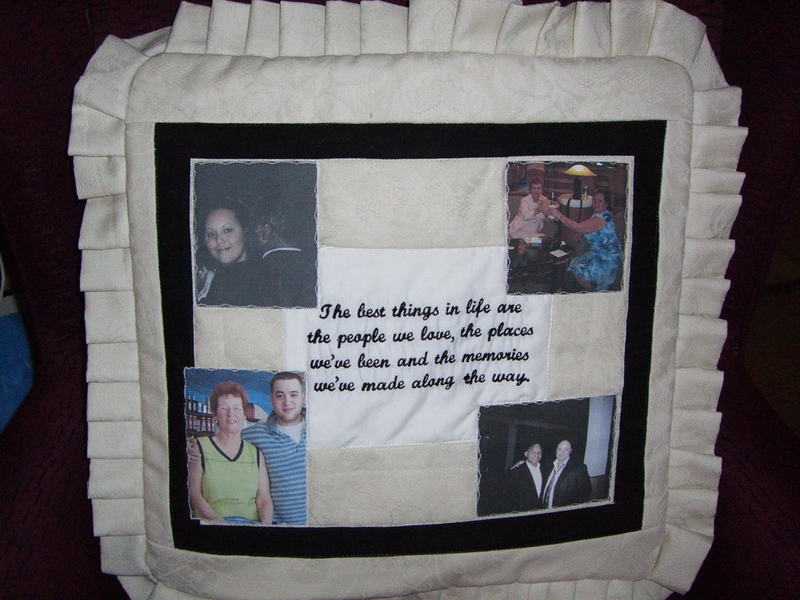 More Memory Pillow Samples in the Graduation and Wedding/Anniversary sections. ASAP with a cost quote and estimated time of completion. 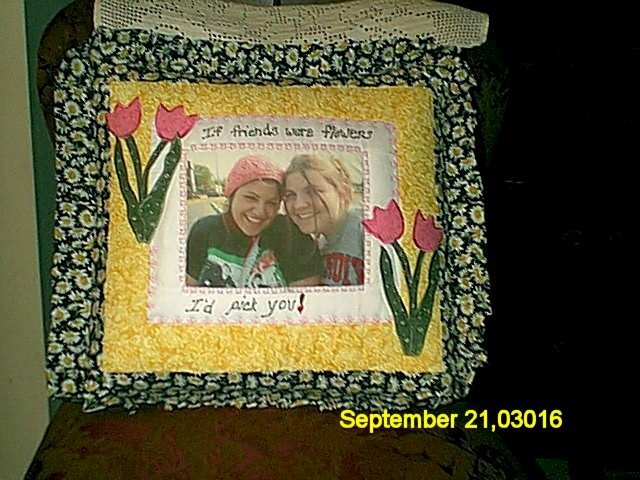 If referencing any of the Pillow Covers on this page, please give us the page name (Memory Pillows) and Pillow Cover name. charm. 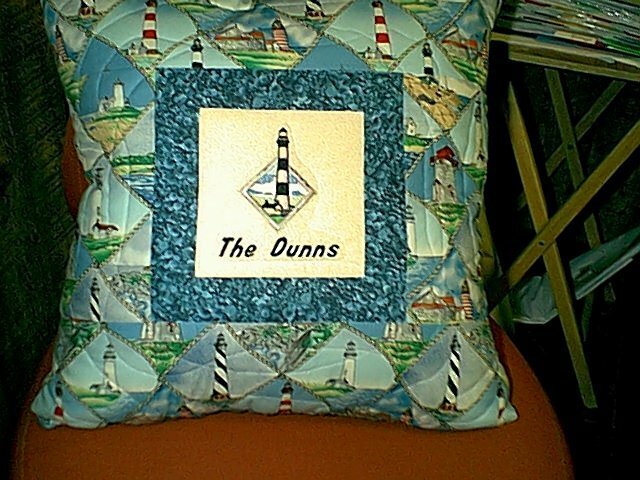 Use number given to identify the pillow cover design you would like to order. Regular $30. A muted, vintage-look fabric is used for the outside border and ruffle. You may provide your own Personal Hanky $30. 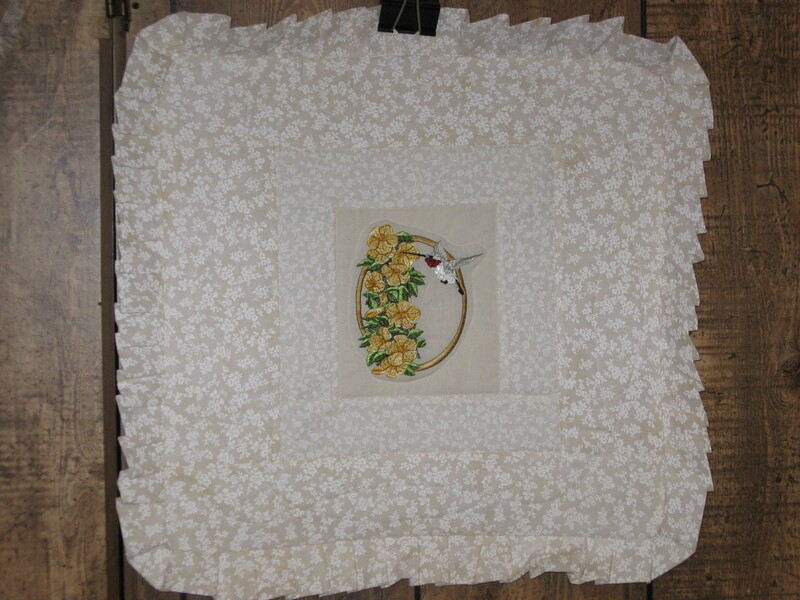 Or we can use one of our many Vintage Hankies and add a Doily if you like! 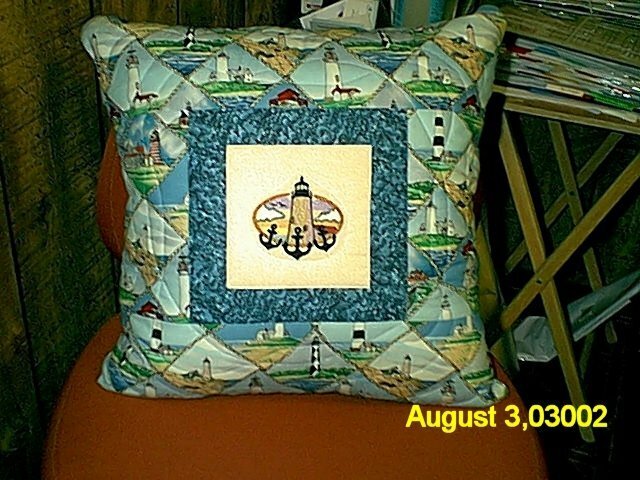 Vintage Splendor Pillow Cover-The Pillow top is a pieced design called Crazy Patch. This allows us to use many muted, old-fashioned looking prints to capture the Vintage feel. Decorative stitching and Embroidered Designs add a touch of elegance. Color choices are White, Antique White or Ecru. 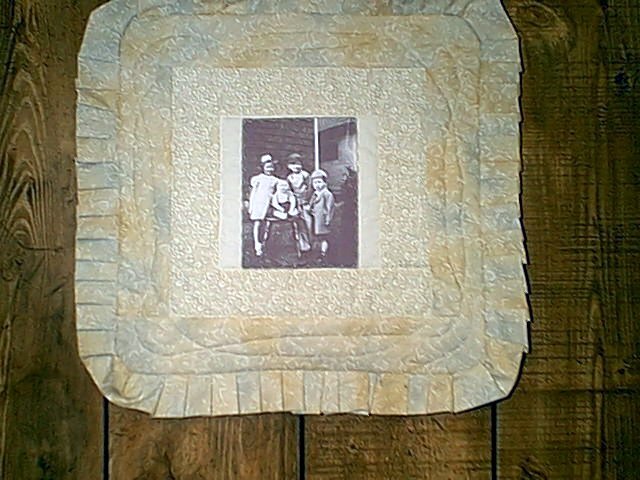 Photos may be copied in Color, Black/White or Sepia for a truly antique look! We have many linens or you may supply your own! 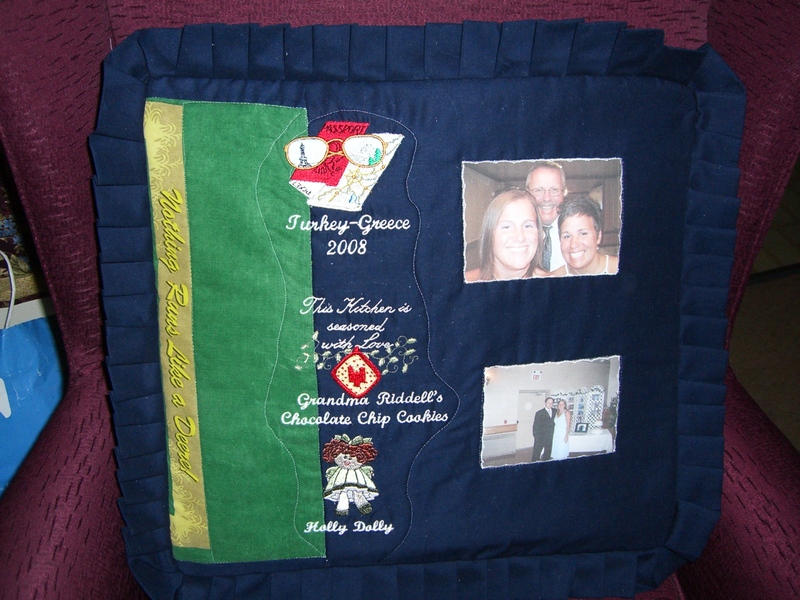 Photo may be added + embroidered personalization. 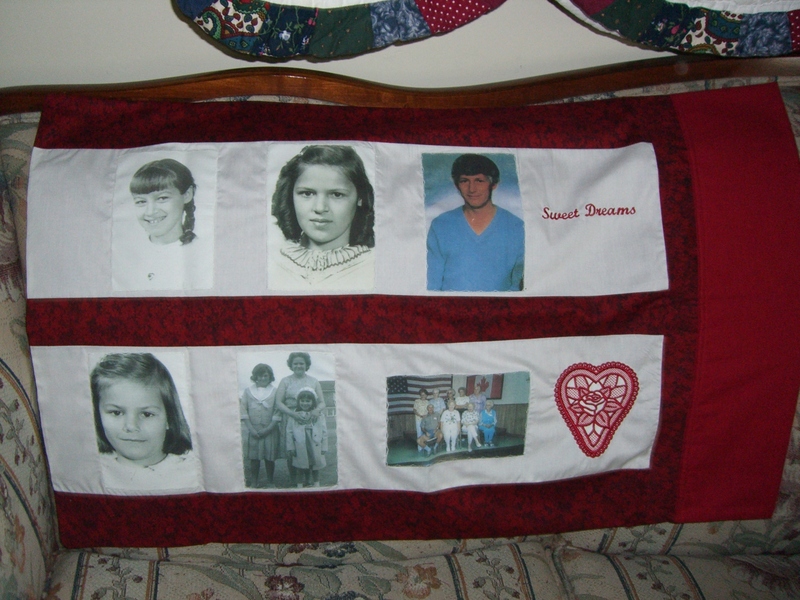 Some Vintage linens used. Larger sizes available. 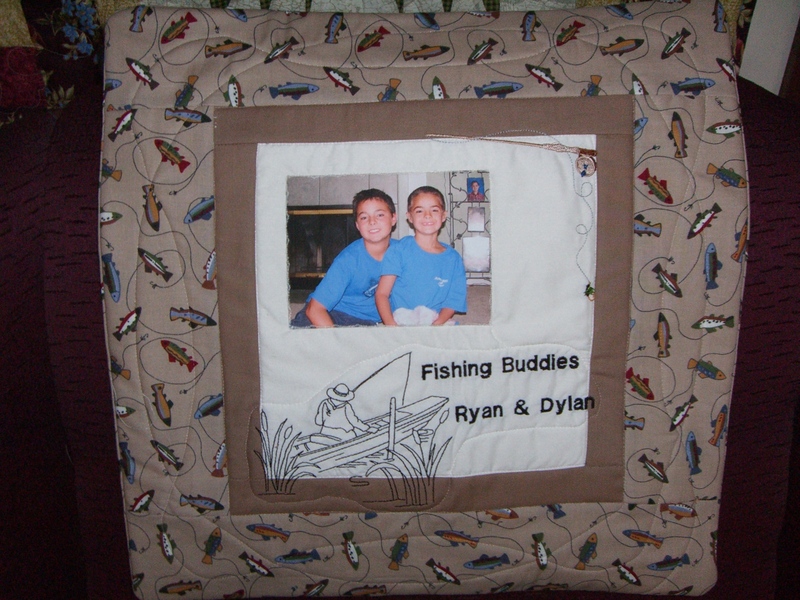 Pillow Covers can be made in almost any theme imaginable! 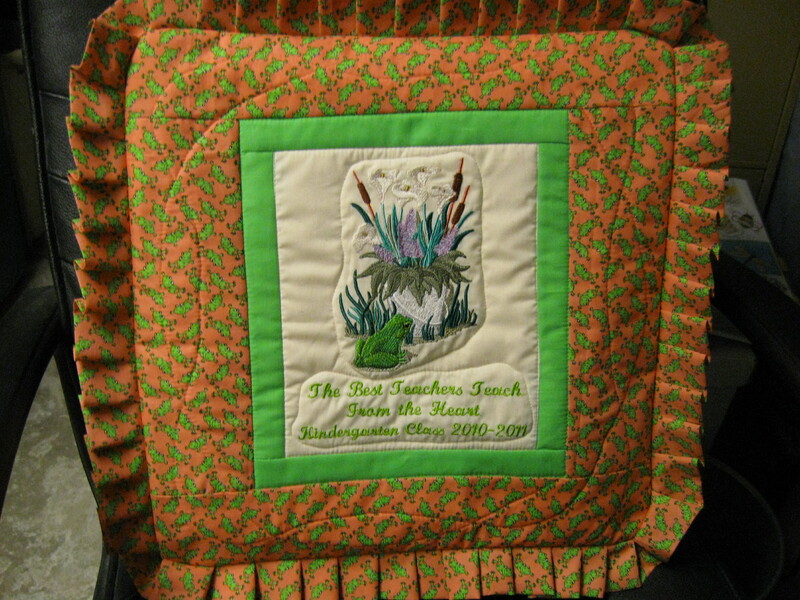 Made to coordinate with the quilt shown below. 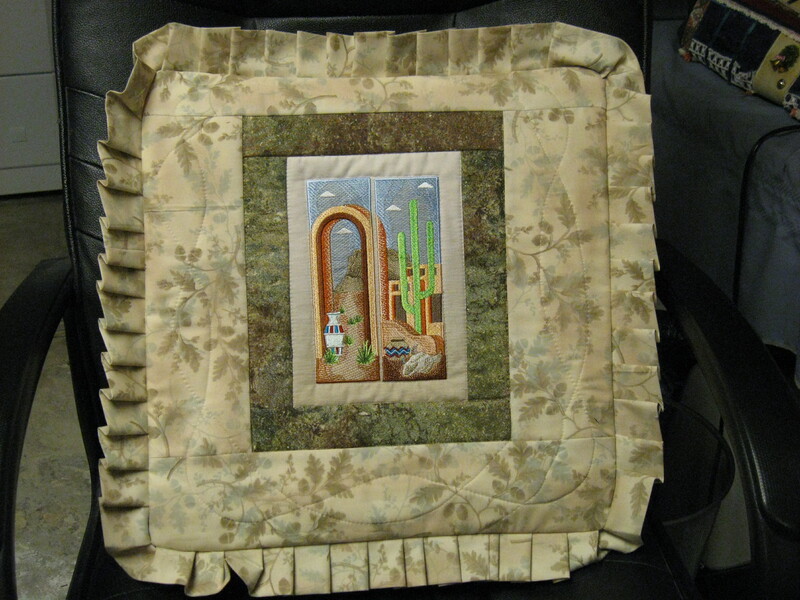 Quillo-A Quilt and Pillow combined! 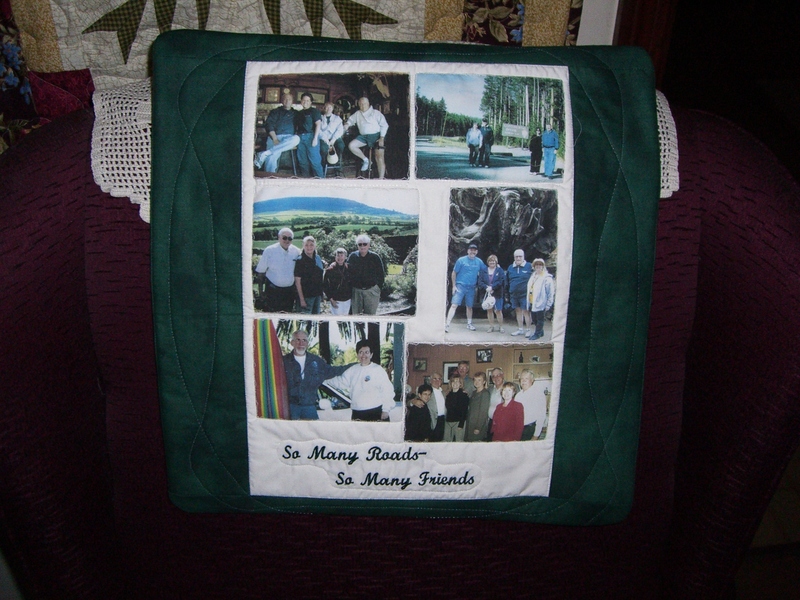 The Quilt folds up into the attached Pillow Cover! 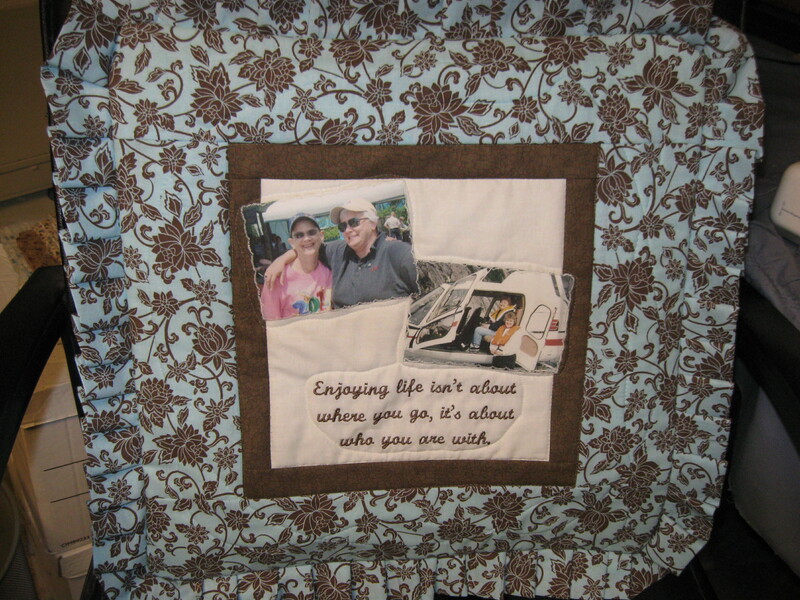 Many great awareness designs available-Photo and Wording may also be added $30. Collage Style w/ wording $35. Made in your Color choice with Wording and Design- $30. 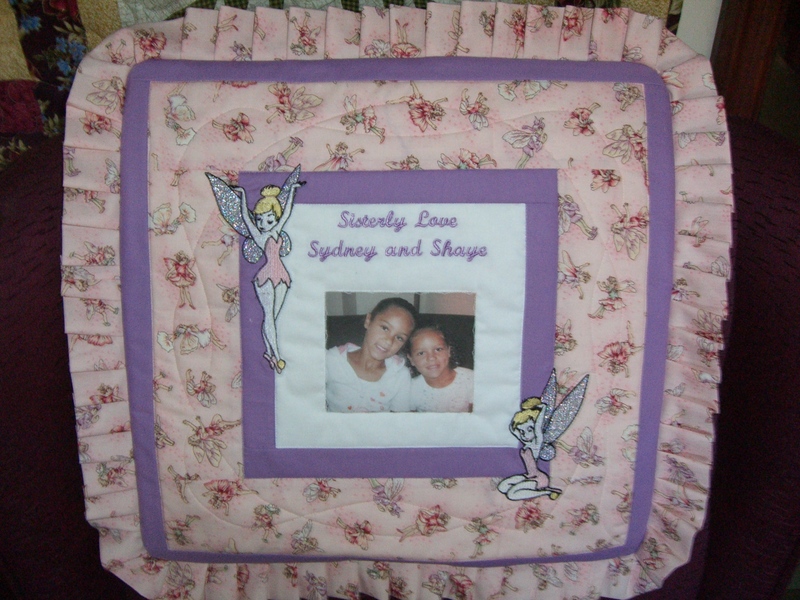 Sweet little Angels or classy, elegant Angel designs available! 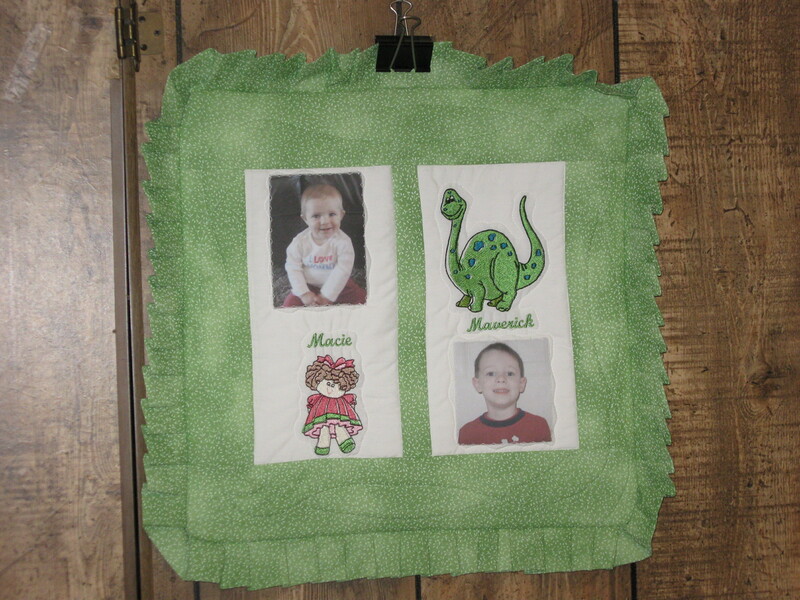 Themed Fabric w/ 3 Photos added and same-fabric Piping- $33. Many beautiful fabrics available as well as Designs in almost any theme imaginable! 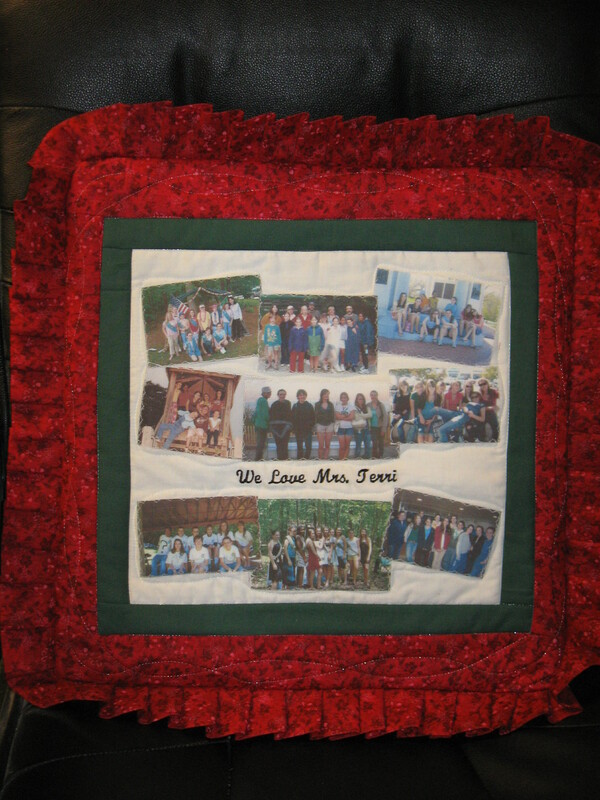 The class photo and Embroidered Wording were added- $30. Many Theme Fabrics available! $30. 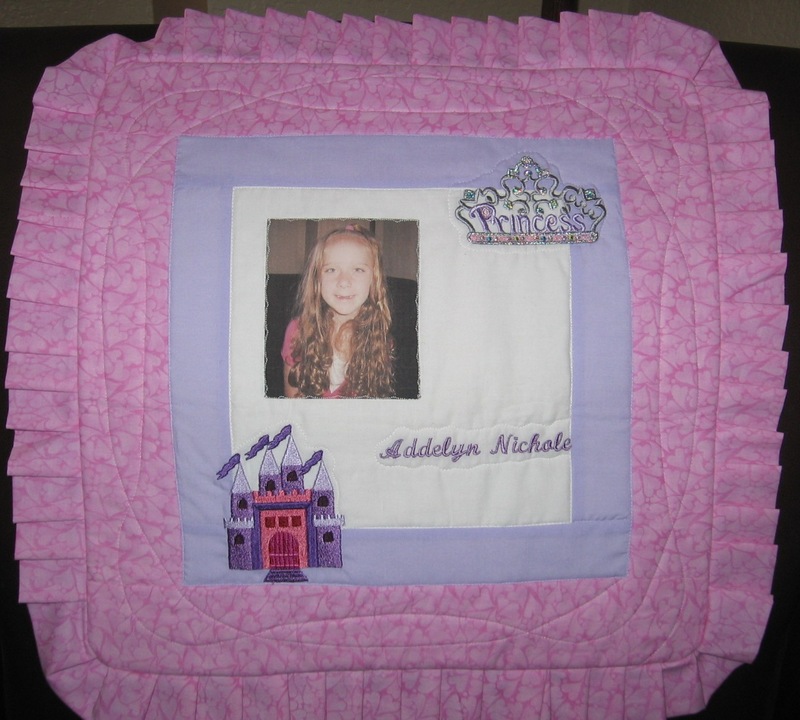 Tinkerbell- Many Disney designs available! 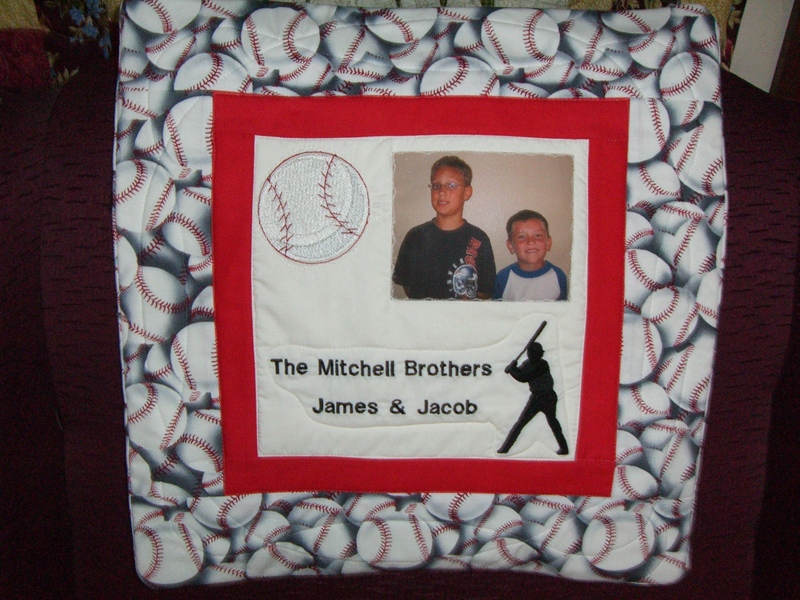 Baseball- Many Sports designs available! 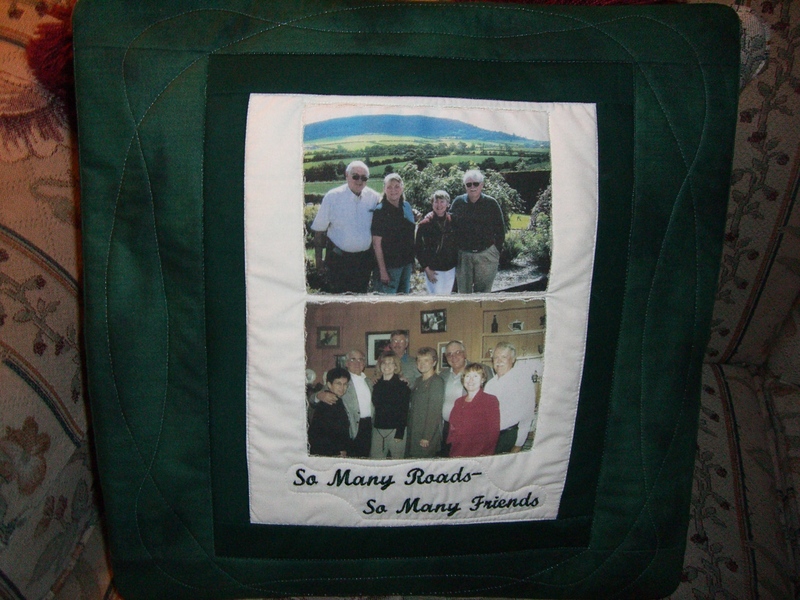 Great gift idea for club members and favorite friends! 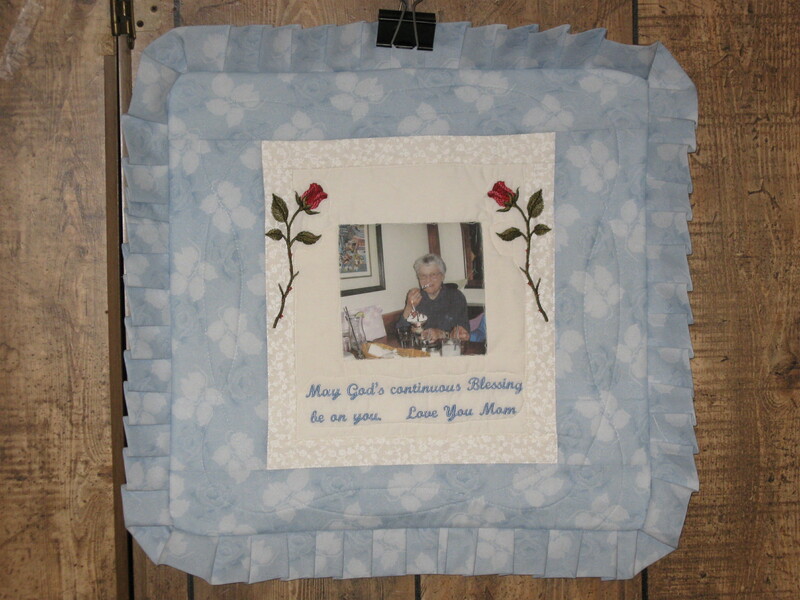 Great gift for that favorite Grandma! $35. Almost any flower available for embroidery-just ask! 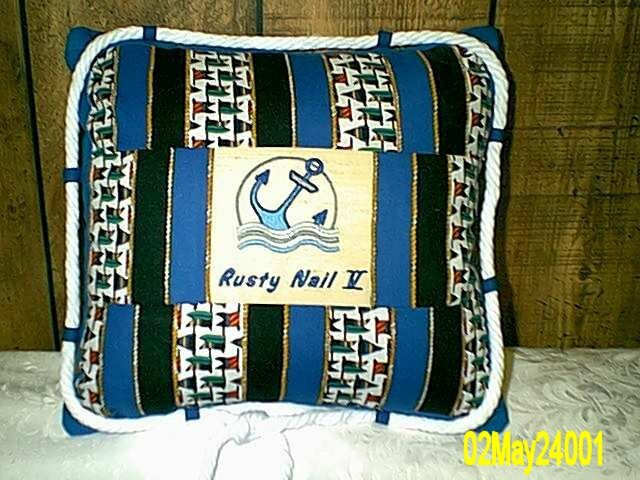 Your choice of Fabric styles and colors $30. 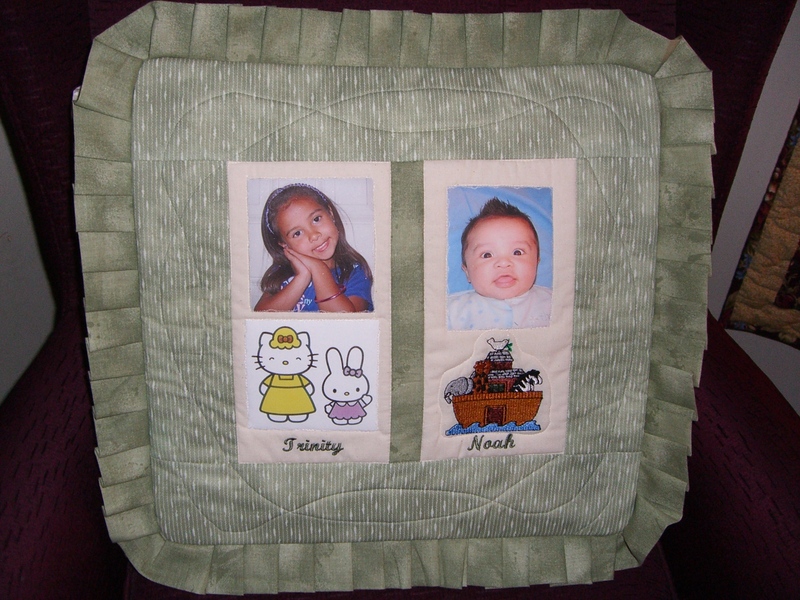 Multi-photos added plus wording- $35. 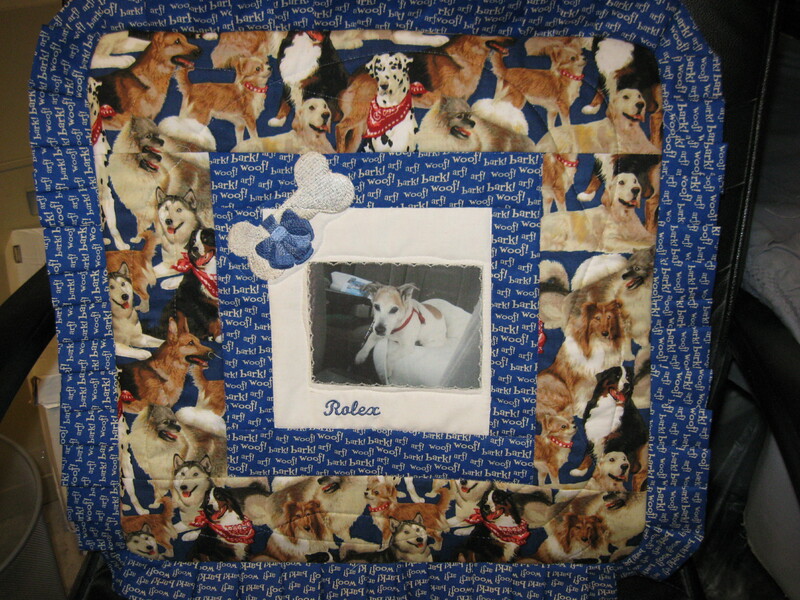 Many Pet Themed Fabrics available- $30. 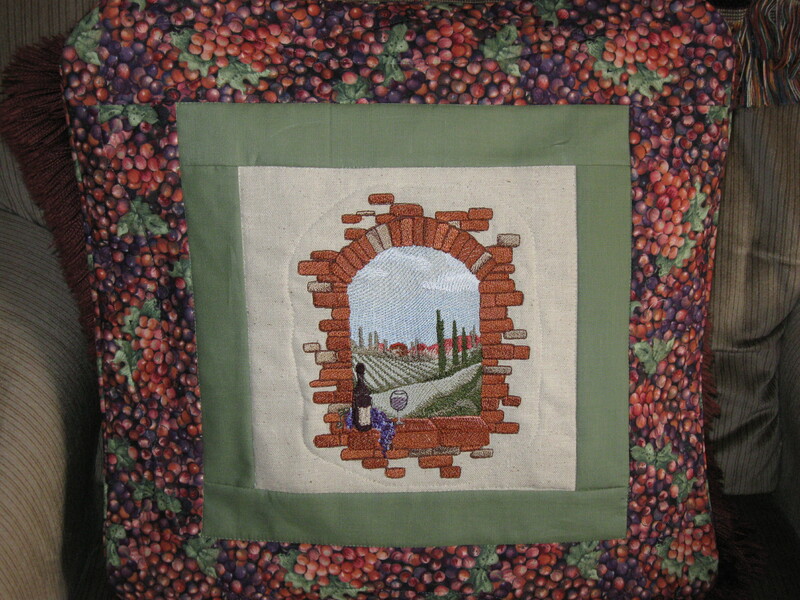 2 'panels' created to feature 2 different themes! 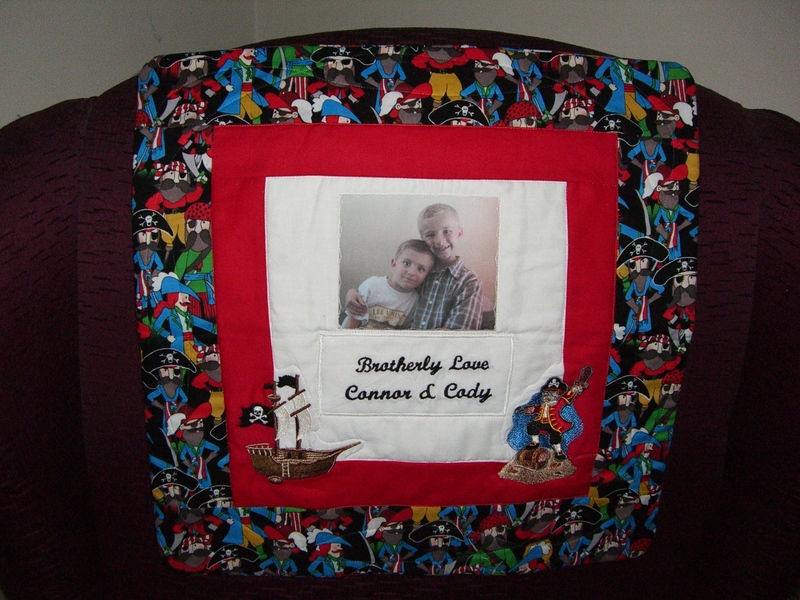 Designs, Wording & Photo added to themed fabric. All State outlines available and possibly other related Embroidered Designs- just ask! 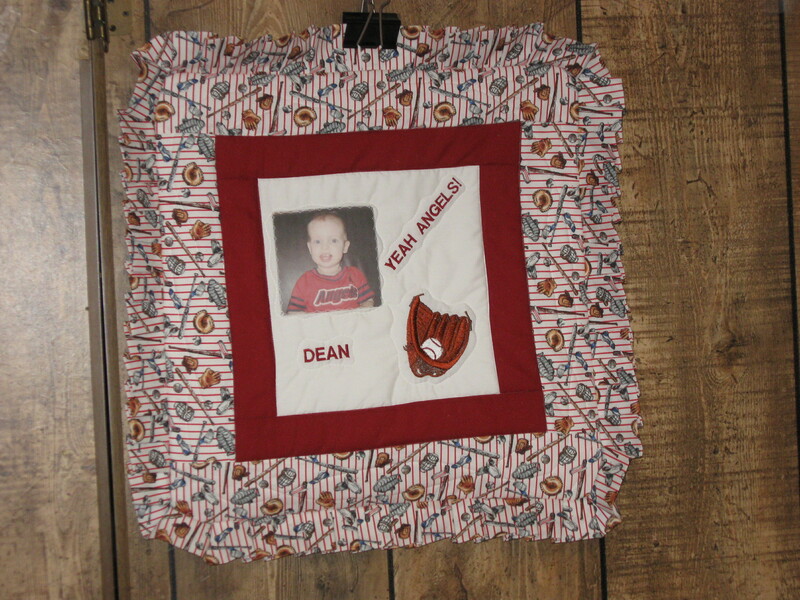 Several Initial designs are available-a photo may also be added- $30. 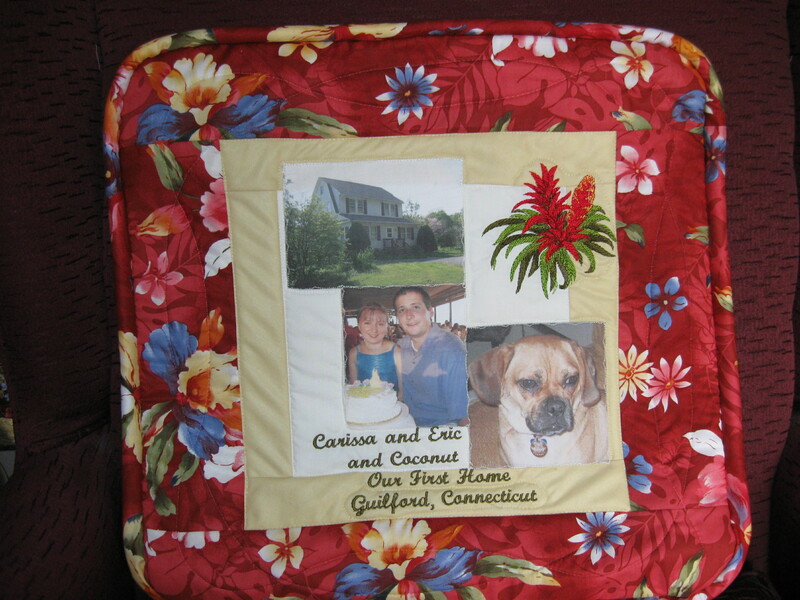 A Memory Pillow Cover to coordinate with your quilt is a wonderful gift idea! Full, Queen & King sizes available-email for pricing. 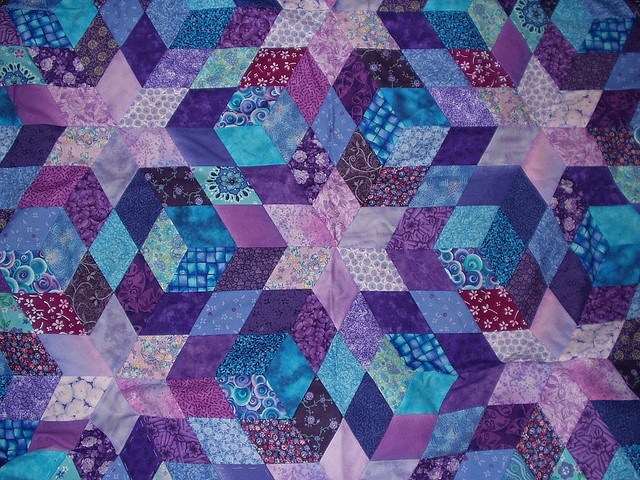 A beautiful coordinate to any Bed Quilt. Almost any theme/design available-just ask! These Covers measure 18" to accommodate T-shirt panels. $30. 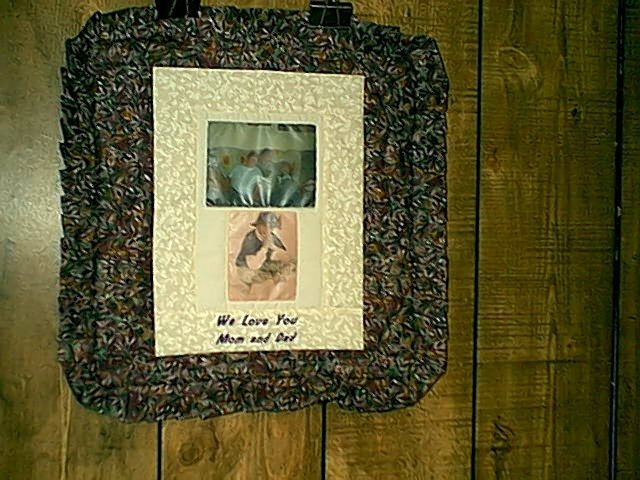 Panel made from your Ties! 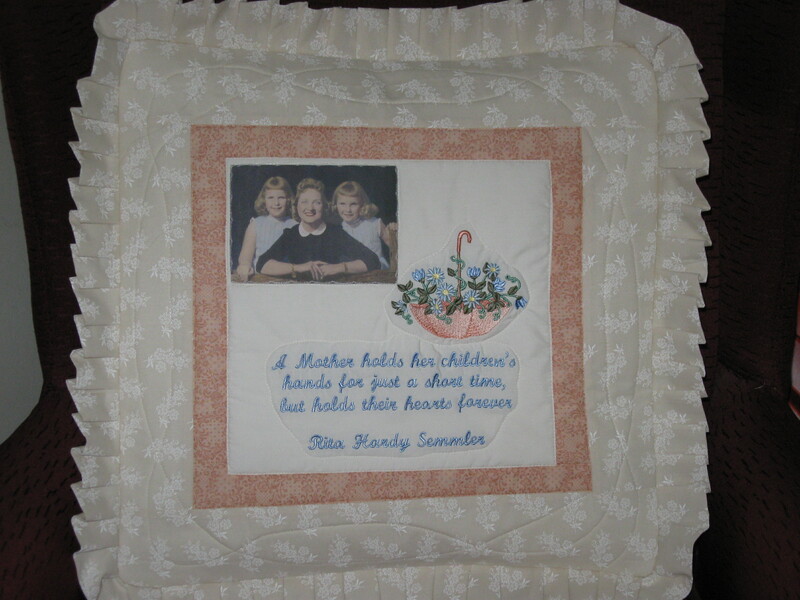 1 Photo, Embroidered Design and/or Embroidered Wording may be added. Dimensional Bowties and coordinating fabrics in your choice of colors. 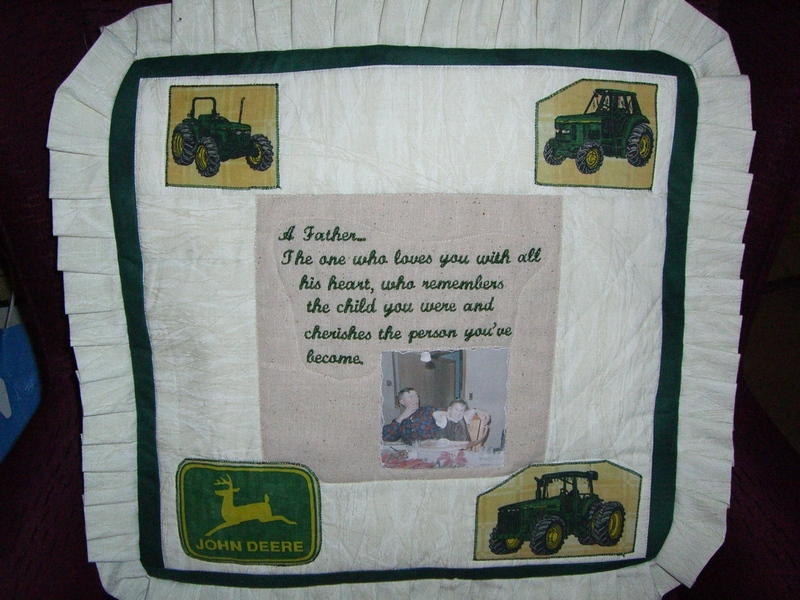 1 Photo plus Embroidered Design and/or Embroidered Wording may be added. 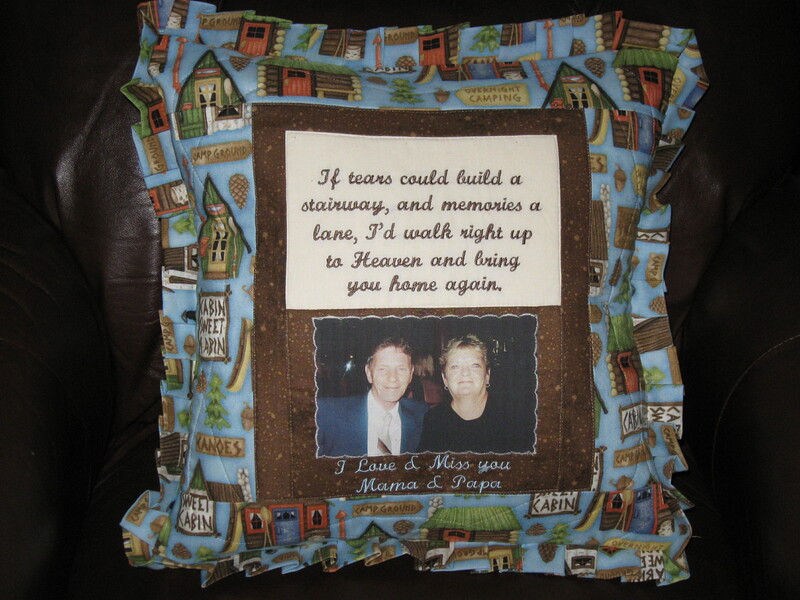 A wonderful way to remember a loved one! Great idea for your Red Hat group and for Fund Raisers! Thousands of designs available in almost any 'Theme'-just ask! Photo may be added. $30. Embroidered Wording and Design $30. 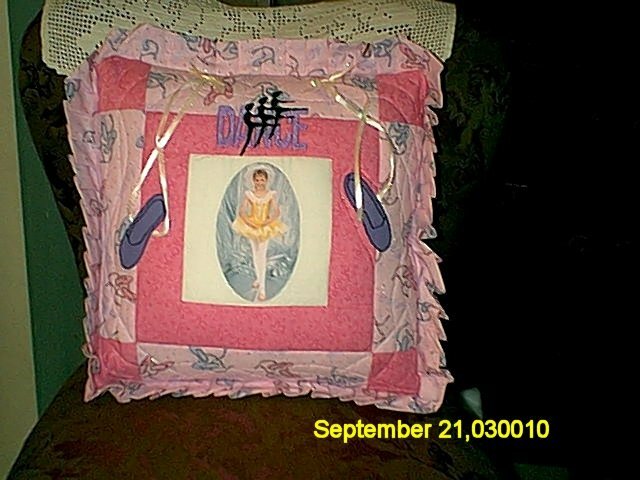 (Due to extra embellishment and Embroidery) Photo may also be added to the Pillow Cover back with Embroidered Wording as well. Just ask! 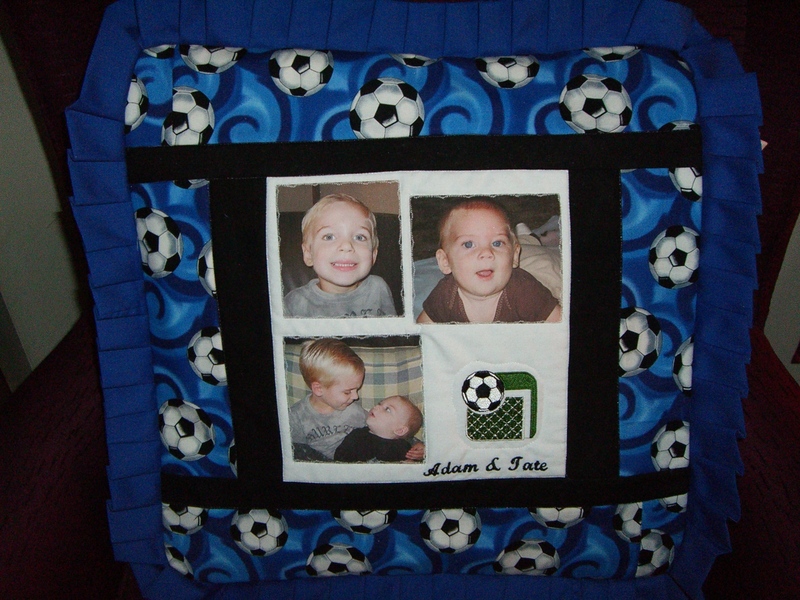 Most Sports Themed fabrics available- $30. 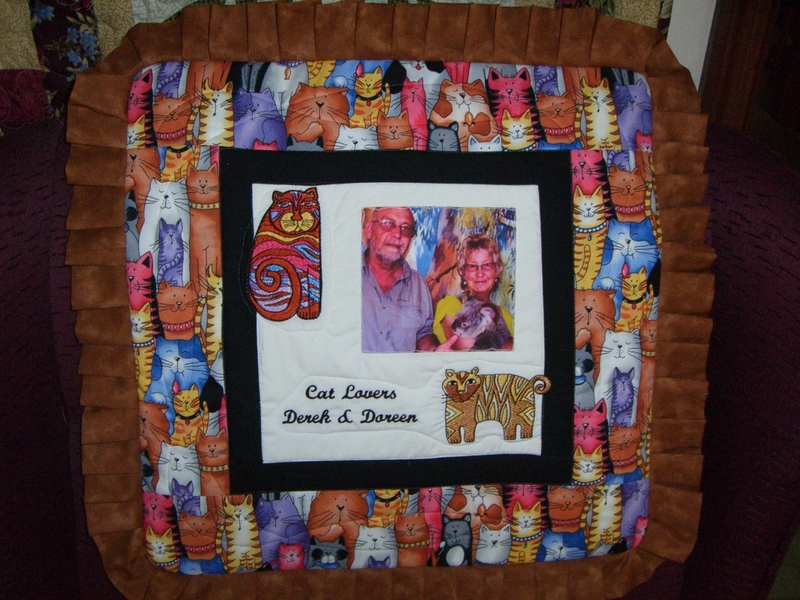 Many great animal themed fabrics available! Camo fabric used for a masculine look and braided cording for edging instead of ruffle! 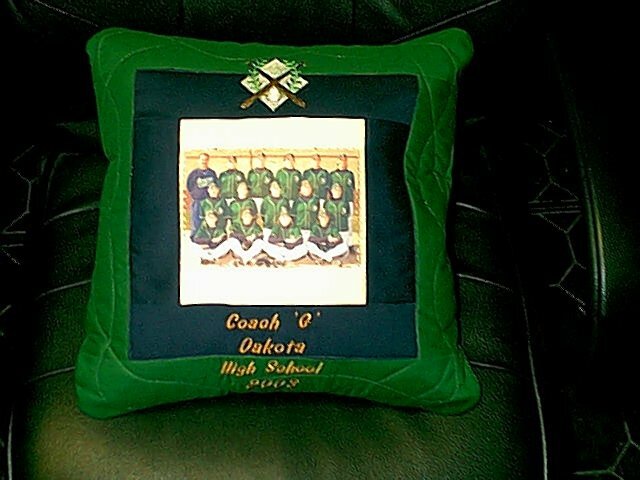 Memory Pillow-Perfect gift idea for a favorite coach! 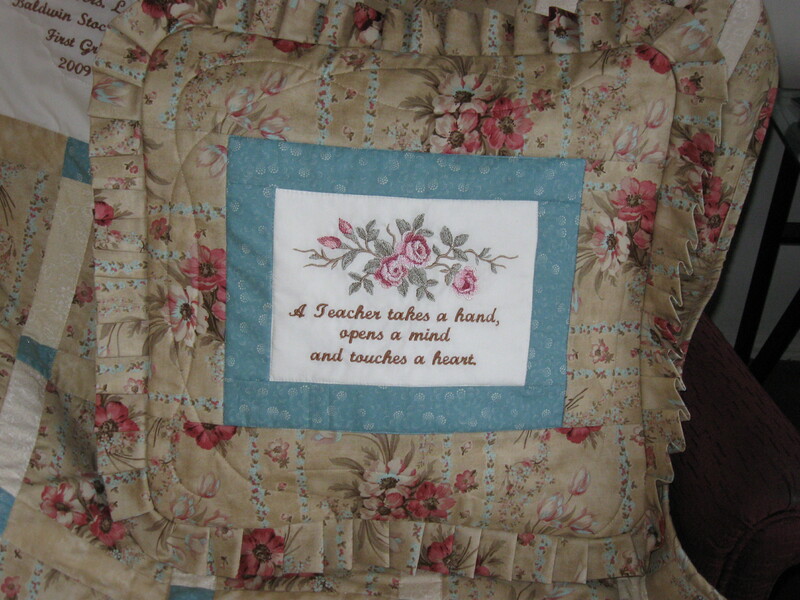 Embroidered Quilt Blocks and Wording added-any color available! 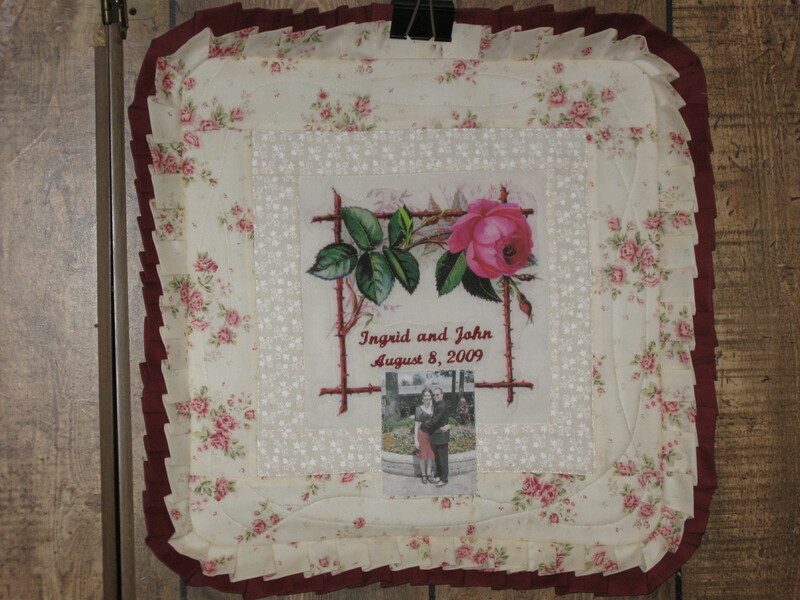 Embroidered and Appliquéd Roses added. 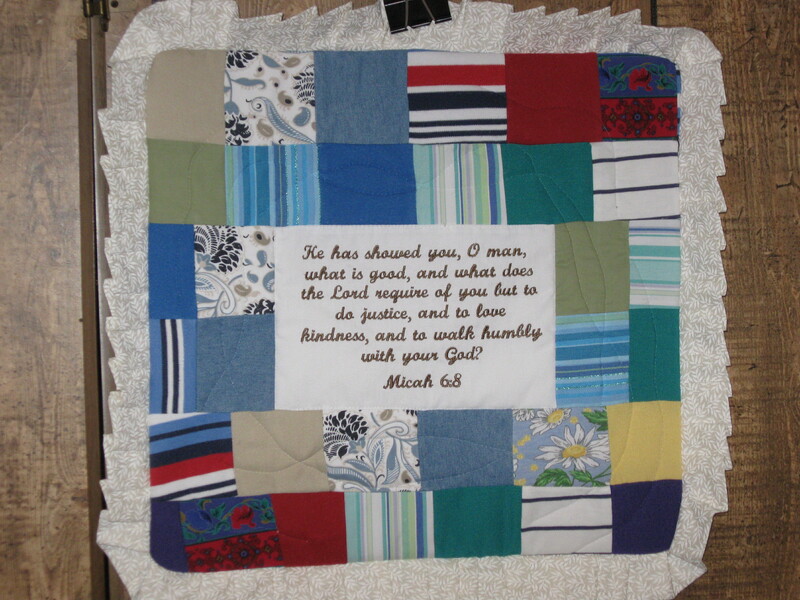 Clothing Pieces used to create patchwork fabric. 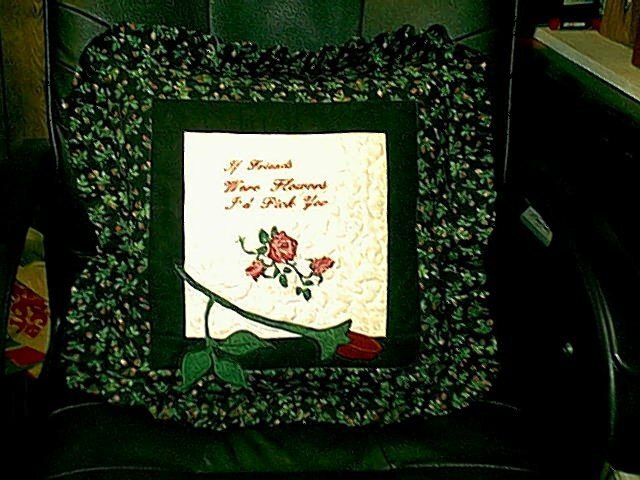 Vintage Splendor Pillow Cover-Includes Linens, Lace and Doilies. Photo & Design or 2 Designs may be added.